The true Ginger Beer Plant dates back to around the 1700's and is not actually a plant at all, instead it is a living organism, best described by a man called Harry Marshall Ward as being "a composite organism consisting of a fungus, the yeast Saccharomyces florentinus (formerly Saccharomyces pyriformis) and the bacterium Lactobacillus hilgardii (formerly Brevibacterium vermiforme)". This organism forms a gelatinous cluster which moves about within its jar naturally, and used correctly can allow you to make a lifetime's supply of authentic, naturally fizzy alcoholic Ginger Beer that used to be commonplace in most UK households. 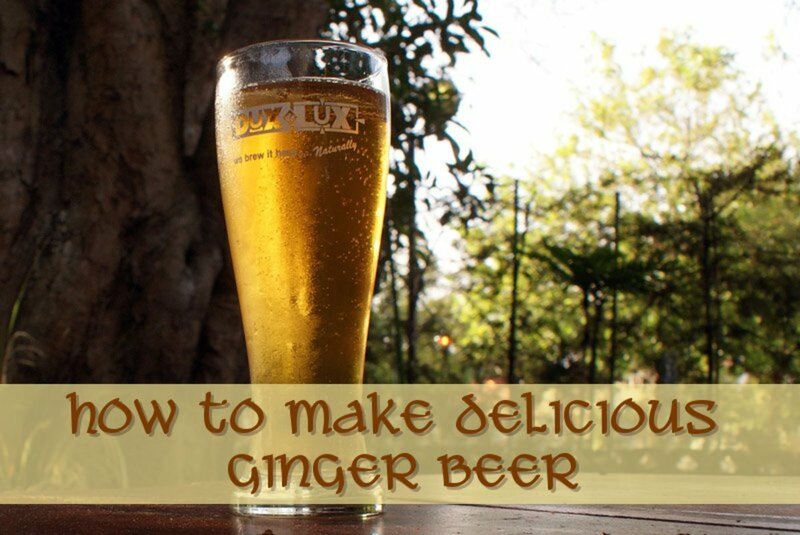 There are many recipes on the Internet for the so called 'Ginger Beer Plant', but most of these call for the use of brewers yeast, which therefore results in fermentation, but NOT an authentic Ginger Beer Plant. Traditionally at the end of each batch of Ginger Beer the 'plant' would be halved, and the second half given away to friends, family or neighbours in order for them to start their own Ginger Beer Plant, whilst the remaining half would be used to make the next batch of Ginger Beer. These days it is incredibly difficult to get hold of an authentic Ginger Beer Plant, and it is widely assumed that this is because it virtually died out during the rationing in World War II. 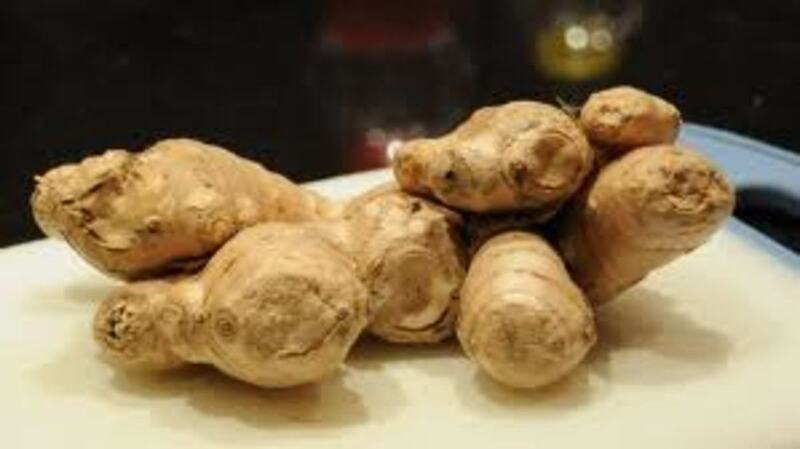 It is not impossible however, and there are suppliers on the Internet selling the authentic plant, although you need to be sure this is what you are buying as there is no legislation governing the description of the Ginger Beer Plant. As I understand it there are some reliable links on Wikipedia which lead to authentic Ginger Beer Plant suppliers. 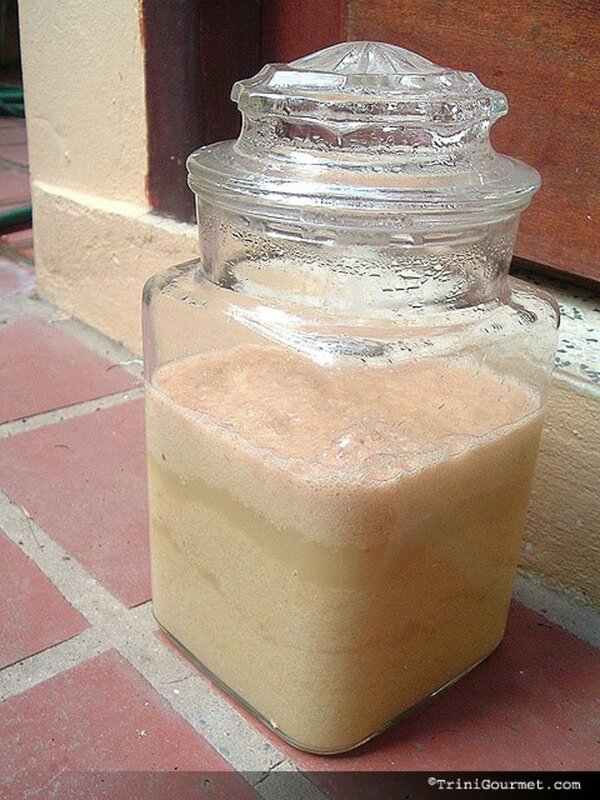 Using this method you will see there is no brewers yeast added to the recipe, the fermentation happens naturally within the jar once the ginger root and sugar are left together for a week or so and the 'Saccharomyces florentinus' yeast is naturally produced. Warning: Producing a Ginger Beer Plant naturally is very difficult and it is highly possible you may not achieve success at all. In all honesty you are probably better off buying a 'ready made' Ginger Beer Plant from a source such the ones I list in the links article at the end of this hub. Dice a tablespoon of fresh ginger root into small cubes and place this into a sterilised jam jar three quarters full of dechlorinated or mineral water. Add two teaspoons of white sugar. Cover the top of the jar with some muslin to allow air flow but protect from debris or insects falling into the jar. Every day for about a week add two teaspoons of sugar and two teaspoons of fresh diced ginger root. Mix ingredients in a jar and cover with a piece of muslin. Secure with a rubber band. For the following week, add 1 teaspoon of sugar and 1 teaspoon of ground or fresh grated ginger daily. Assuming you manage to either make yourself, or to find, an authentic supplier of Ginger Beer Plant you then have the ability to make some delicious, naturally fizzy ginger beer of your own in under a week. The only additional ingredients you will need are sugar, lemon juice, fresh or ground ginger and a couple of litres of chlorine free water, (either use bottled mineral water or leave tap water overnight to allow the chlorine to evaporate naturally). Fermentation vessel capable of handling more than 2 litres of water (could be a bowl or proper beer fermentation barrel). Next sterilise all of your equipment thoroughly. This is where sterilising powder can come in useful, or you could wash your equipment and then place in an oven at 100 degrees plus for 20 minutes. Remember sterilising doesn't clean, it just kills. If you've visible dirt inside your fermentation vessel it will still contain bacteria. Washing up liquid and hot water works just as well - this stuff takes less than a week to make and you'll be transferring it after two days anyway. If using fresh ginger root you will need to scald it before using. The reason for scalding is to kill any bacteria. Wash the ginger root and then drop it into a saucepan of boiling water for a minute or so. Remove the ginger root carefully and then grate it. Add water to the fermenting vessel. Juice the lemon, you can also grate a bit of the zest into the grated ginger. Put a teaspoon or two into the water. Add the ginger and lemon zest into a square of muslin cloth. Pull the sides together and secure the corners into a bundle with your elastic band. Add the sugar to the water and stir in. 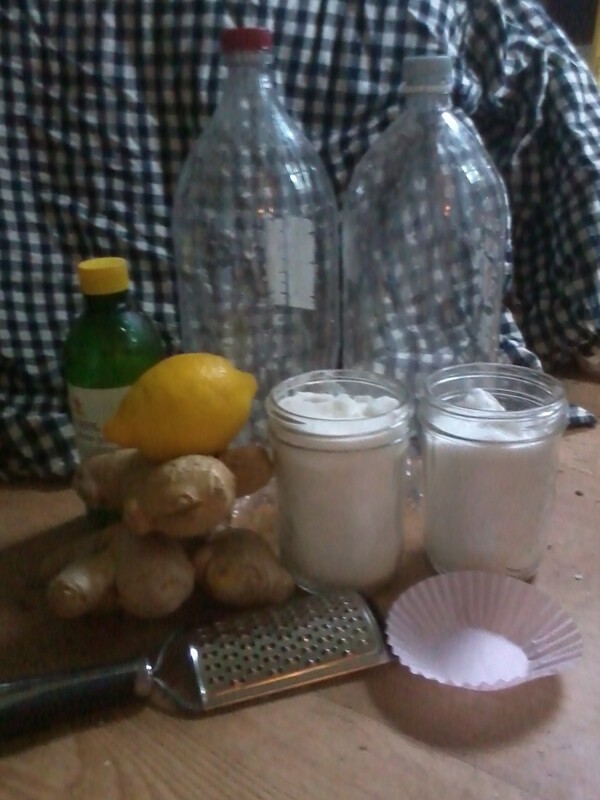 Now comes the time to add your Ginger Beer Plant to the mixture along with the grated ginger muslin parcel. Seal the contents of the fermentation vessel with a lid and assuming this is now airtight add an airlock to allow air to escape. Failure to do this can result in the container exploding as the pressure inside it builds up, if you are using a jar or bowl you can simply cover the top of it with either muslin or a tea towel and secure with an elastic band. You should always leave a third of the jar or bowl empty to allow for expansion. Wait two or three days to allow the fermentation process to work. Place a funnel inside the neck of a clean empty plastic soft drink bottle. Line it with a double thickness of muslin. Carefully pour your fermented Ginger Beer through the muslin in the bottle. Fill to about two inches short of the top. The gelatinous substance that remains in the muslin is your Ginger Beer Plant and should now be returned to its jar in a warm place, two thirds filled with dechlorinated water and fed daily with a teaspoon of sugar and half a teaspoon of ginger. Keep the level of dechlorinated water topped up until you use your Ginger Beer Plant next. Keep a lid on the jar (or a piece of muslin secured with an elastic band), but don't tighten it completely or your jar will explode, air has to be able to escape. As your plant gets bigger you will need to halve it and either some it to a friend so they can start their own plant, or discard it. Squeeze all the air out of the bottle so the Ginger Beer reaches the top of the bottle then screw on the lid. 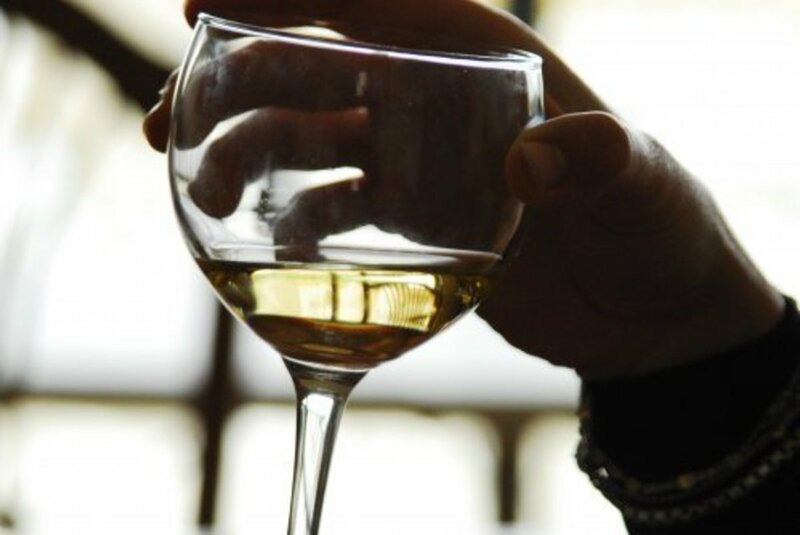 Leave the bottle at a comfortable room temperature for a few days, or until the bottle is hard and has expanded due to the natural production of Carbon Dioxide within it. Carefully open the bottle and let the pressure escape. At this point you have two choices, you can repeat the process of squeezing the air out of the bottle and sealing it again in order to make the Ginger Beer more dry, or you can simply place the bottle in the fridge and drink when cold. Optional: pinch of cayenne chilli powder or juice a little fresh chilli in the same way that you juiced your ginger. Please wash your hands very carefully after juicing chilli! • If you’re using fresh root ginger then start by preparing this - if using a juicer, peel and juice the ginger. 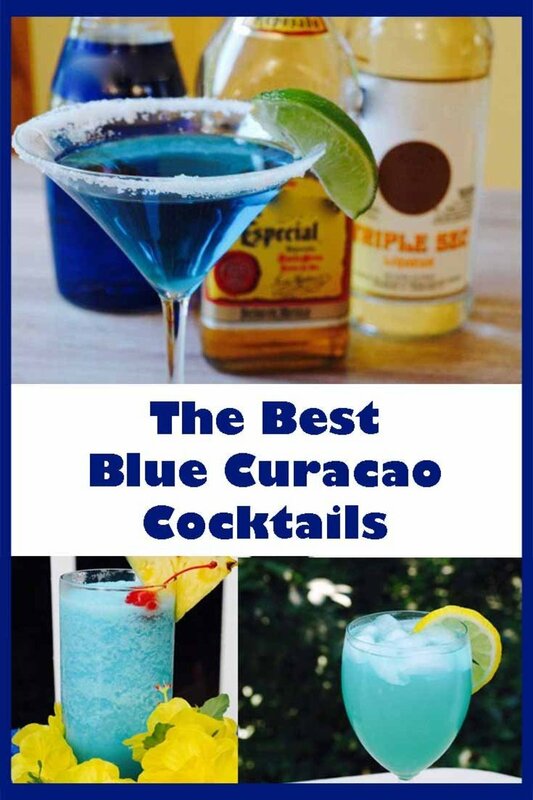 If using a blender, blend the peeled, chopped ginger with a little filtered water until it is a pulpy consistency. If using a grater, grate the peeled ginger to get it to a pulp. Now squeeze this pulp to extract the juice to use in your ginger beer. This can be extracted by pressing the pulp through a muslin cloth. For a stronger flavour you can wrap the squeezed pulp in a muslin square and secure it so it can be added to the jar. Again, experiment to find the flavour you like best. If you don’t want the ginger pulp in your brew, just stick it on your compost heap or in your food recycling bin if you have one. • Add the water to the jar containing your Ginger Beer Plant. • Then add the ginger juice (or powdered ginger), sugar and lemon juice (and chilli if using) to the jar. • You need to have about a third empty at the top of the jar to allow for expansion. • You can then place a muslin or tea towel over the top of the jar and secure it with an elastic band. • Now leave it for a few days, tasting it every so often. When it starts to develop a nice flavour but still has a sweet taste, then it’s ready to bottle. 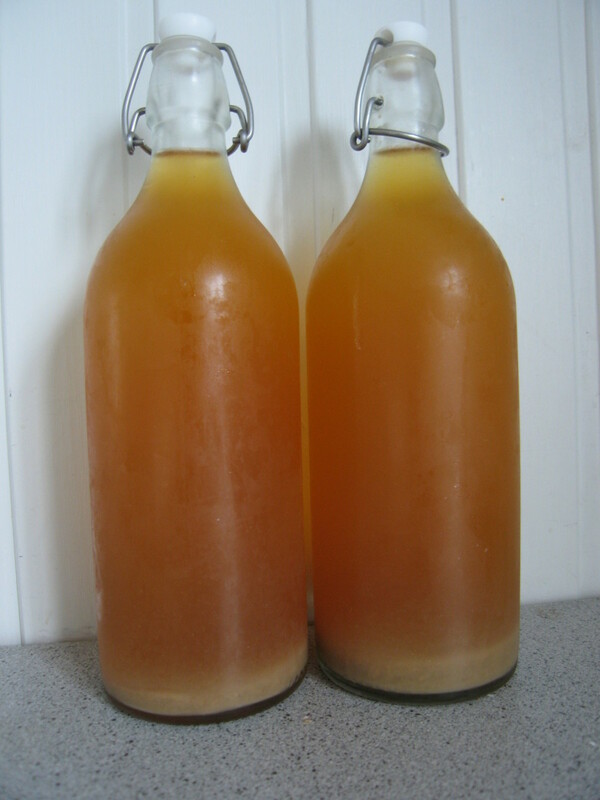 Homemade Ginger Beer makes an excellent Christmas gift and has the advantage that it can be made very quickly. Another great gift is the actual Ginger Beer Plant itself, either as a portion of your own plant, or purchased from a reliable online supplier of the authentic Ginger Beer Plant. For an unusual gift that keeps on giving, why not buy a Ginger Beer Plant for your loved one today. I’d give it a try if I were you Melissa. It’s largely a case of trial and error so worth trying. Sorry to bother you, my plant is bubbling, but not really frothy, its not getting more bubbly and im worried about using it too soon or too late..its been 8ish days...should i keep going until its really frothy? or is bubbling good enough to brew? thanks! Just keep adding it Melissa. Good luck with your batch. Hiya, I am making my plant, everyday I am adding fresh ginger, its starting to fizz and is a nice murky whity color, it seems like something good is happening and I have high hopes.. I think I am on day 3 or 4... I am just wondering.. do I discard the old ginger everyday when I add fresh ginger? Or do I just keep adding more and more ginger? Both versions will be alcoholic, whether through the natural yeasts or through added brewer’s yeast. The natural method can be prone to failure so it is worth experimenting with different environments and temperatures etc until you get the balance right and see evidence of ‘life’ within the plant. Hi, great recipe... couple of questions though. It's this alcoholic - out will the yeast version be? Also, I made a similar plant, but everything is just sitting at the bottom after 5 days - no foaming. Has it failed, so just try again? My friend makes ginger beer, and other fermentation edibles, I will send this article to him. His ginger beer is awesome, but his Kvass will send you on your A$$. Yes it will be alcoholic because of the fermenting process. Is this alcoholic? If not how can I make it alcoholic? Sorry Maggie, to the best of my knowledge there isn't a way to scroll through all the posts without reading all the old comments. Can you tell me how to return to recent posts, without going through scrolling of 6yrs worth. I tried excluding the air. Oooops it didn't like that all at all...sigh n smile. Maybe today's Leicestershire sunshine will revive it...grin. Hi Maggie, I think the key thing is warmth rather than light. Traditionally I believe the kitchen windowsill is the place housewives used to keep it, but I had mine under a radiator in the lounge (during the winter) and it seemed to work well. And thank you Cindy for a very informative read. Gosh 6 years worth of posts and comments. Smile. I will get to grow a successful ginger plant. I will. I will. Smile. I don't imagine stirring it would cause a problem, but cannot be certain. I would suggest that if it smelling sweet and is frothy it is probably about the right time to use it. Give it a go and let me know how you get on. my plant isn't moldy, but it isn't frothy either. but it does have the nice sweet ginger small. Each time I added the ginger and sugar, I stirred it well. Not sure if I should do that or not. but its now been a week since I stopped adding the ginger and suger. It's whitish like in the picture. how long should I wait? does it interrupt the process if I stir it? "Squeeze all the air out of the bottle so the Ginger Beer reaches the top of the bottle then screw on the lid. Leave the bottle at a comfortable room temperature for a few days, or until the bottle is hard and has expanded due to the natural production of Carbon Dioxide within it." Instead can you use a glass jar with an airlock lid? You are so lucky Gloria. For most of us it can take a number of attempts to get the right bacteria. Like you say it must be the wonderful climate where you live . Wow, must be our hot climate it Australia - we have super bacteria! I always put unpeeled chopped ginger in sugar water, feed every day and Viola! 3 days later, a fizzy ginger plant. Even in the middle of winter. Maybe 'cause my kitchen is full of kefir already? Never had an issue. Do it every summer now, then pitch it in the compost come winter - start another in spring. Make all sorts of sodas and alchoholic beverages from it. Reckon it must be the climate. Lol, perhaps you should try making it again yourself. Now you are an adult you may find your tastes have changed and you really enjoy it. It doesn't have to be too peppery depending on how you make it. He gave me a small glass full, but it was so peppery hot all I could manage was a sip LOL. When I was a kid ( many years ago) I had a friend who´s Grandad made ginger beer and we rode a long way on our bikes to go and visit him and taste it. My god it was like drinking liquid fire LOL. I wonder in those days where he got the ginger from as it was something I don´t think I ever saw for sale in a shop, though you could buy powdered ginger. Bet the batch with all the pepper in was fiery lol. Guernsey is a very small island just 25miles square. We are very close to France and can see St Malo on the horizon on a clear day. We are not a part of the UK, but are what is known as a Crown Dependency. Basically we are under the protection of the queen, but are self governing. Guernsey is a beautiful and safe island if ever you get a chance to visit it. Working on the last 2 liters of ginger beer. May not last til Sept 30 so gotta drink it before holiday. It's strong & hot. (like my wife:-) This batch had cayenne pepper, red pepper and ground black pepper blended with the grated ginger & lemon rind. Rambunctous is an interesting person. Just watched his movie. Reminded me of the NRK TV footage of the slow boat going up the coast of Norway. It lead to other ginger beer utubes which I'll watch one day. Also googled Guernsey and was surprised it is closer to France than UK. Couldn't find Isle of Wight...too much ginger beer! When I was diving in Northsea the Norwegian divers had their salary sent to a company in Isle of Wight. Stupid American me paid Norwegian taxes. Will let you know how the next batch turns out in a month or so. Sorry to hear you have been unlucky and lost a couple of batches. Fruit flies are horrible things and always seem to end up in my glasses of wine no matter where I am. hope you have better luck with the new batch. When you get time it is worth reading the comments thread in full as there are lots of useful tips and snippets of information various people have shared within them. 2 batches of GBP down the drain.....just as I was getting good results after 5-6 months of production. Scooped fruit flies outta last 2 batches and continued process. Now had 2 jars going with double muslum cloth but had a layer of fruit flies in each. Going to Jerusalem and back Sept 30 and start all over. So far, never a bad batch of GBP with ginger, sugar & water. Knock on wood!! I've skimmed thru the comments above and quite interesting comments & people. Sounds like your wife is right and you should be selling it then Richard. Wish I could taste yours as it sounds lovely. Ginger beer manufacture is still ongoing with great success. Only had 1 bad batch so far and was 5 liters down the sink. I read that molassas could be used and had a large jar of blackstrap molasses and used instead of sugar. It fermented perfectly with lots of pressure in the bottles. The result was a perfect looking guiness with a perfect foamy head. Taste was the worst I'd ever tasted. No one would drink it. Now it's only sugar, ginger & water for a perfect drink. Sometimes the GBP tastes a little sour but extra sugar puts it on the right track again. Wife thinks I should bottle & sell. A small bottle sells for over 30 noks in Norwegian health stores. Mine is better! Awesome thanks. I started these 2 experiments on Saturday. As of this morning, the "fake" plant was frothy for the first 2 day but has since settled and i dont see much action. the "genuine" plant has small bubbles forming on the outside. Does this sound OK? again thanks for all the info. Great question Mike. I am basing this on a standard sized UK jam jar that holds about half a pound of jam. 3/4 of one of these is about 300ml. Hope this helps. Hello. First thank you for the post. I am just starting to try and create a GBP and found your information very useful. I am trying to create one of each GBP you describe above. Question: you say fill a jam jar 3/4 way full. Can you tell me how much water this is? I honestly have no idea on that one Richard but would be surprised if it would do you any harm just because it smelt like alcohol. Seems it is still working if things are starting to bubble. Good luck and let me know if it all works out okay. After bottling the ginger beer I often put the ginger remaining in the muslin in an airtight container and into the refrigerator. When ready I dump into a quart jar, fill 3/4 water. add ginger & sugar and get immediate results. Last batch of refrigerated ginger had strong alcohol smell but used anyway. Starting to bubble. Any idea how long it can be refrigerated before going bad and could the alcohol smell be dangerous and be dumped? If you keep feeding the 'plant' with sugar and ginger it should go on forever. re the pear aroma, well I have to say that is a new one on me lol. So long as it tastes good I wouldn't worry about it. Does anyone mention a pear aroma & flavor? My wife says it smells like pear juice and has a pear flavor. Not that it's bad tho. Hi Richard, based on your results it appears the sequence does not make much of a difference, but you could try various ways to see if it improves the results. Sometimes experimenting with methods can lead to new ideas and a better finished product. Just reread your instructions. Is the sequence important? I put 350 - 400 gr sugar in plastic dough raising bowl, add 2 liters tap water, stir with a woden spoon til the sugar is dissolved, grate lemon zest in a piece cloth, cut the lemon in 2, squeeze the juice into the bowl, drop the lemon into the bowl, grate an inch or 2.....or 3 of ginger in the cloth with lemon zest, tie it up and drop it into the bowl, then pour in the gbp and snap on the plastic lid. It pops off at a certain pressure with a nice loud pop. After looking thru many places, this was the easiest ginger beer plant to make. I'm not a control freak but cleanlines is next to Godliness so I didn't bother with sterilization. The gbp was making little bubbles after 2 weeks so I followed the recipe and made nearly 3 liters of ginger beer. Then put the ginger back in the glasss jar and more gbp on the way. I woukd suggest periodically testing for alcohol content using a hydrometer as well as tasting the brew to test for flavour. It has been a long time since I last made any now, but if you read through the comments here you will find that a couple of people have been experimenting with different techniques in order to get the best results. I think you would get some very useful info based ion their techniques. I pulled a gallon of my ginger beer and pitched some EC-1118 yeast I had lying about will let this ferment to dry just for fun. I have now racked the latest batch to the bottling bucket O.G. 1.076 tested today as 1.045 est A.B.V. ~4%. I thing this will finish the same in the bucket before I bottle or consume it all. Sounding good. It will be interesting to see how high the alcohol content ends up. Well another two weeks has passed I pulled a sample and tested S.G. today it is at 1.050 has not moved much but is moving. Flavor is very good and crisp. Dry hopping fresh ginger into the secondary has added a little more tongue bite. Est. A.B.V. ~3.3%. I guess I will just let it keep going for a while yet as long as I still have air lock activity. Well I brewed a new batch today following previously listed recipe. O.G. was a match at 1.076. I plan to stir twice daily for the first week then let it go for two more. After that I will rack off the fruits and will dry hop so to speak with another 2 oz chopped ginger that has not been boiled to see If that gives a little more ginger heat. Will keep you posted. Okay, change of plan, I just watched it tonight anyway. Wow, thanks for the mention in the video. Good video, I especially enjoyed it once you showed the speeded up version so you could actually see the plant moving in the jar. Great stuff. Glad yours turned out so well, looking forward to further updates. Well I did get 10-16oz bottles from the 5gal batch but now only have 2 left. Those dark and stormys are really good. Starting a new G.B.P. will let you know how it progresses. Ooops might just have made a huge mistake. Racked the ginger beer into a bottling bucket. Access is too easy and flavor too good. This may never even get to a bottle for carbination. Leaving out the bark sounds like a good tip then Rambunctious. Looking forward to doing my own first batch (since our house move), but tricky as I am also starting up a small scale free range egg business and this will take a lot of my time until we have a good customer base established. Having a dark and stormy from sample. I just racked my 5.5 gal batch of ginger beer. O.G. Was 1.076 now it is at 1.040 still a little too sweet so I will let it go for a while yet before bottling. Taste test it is pretty good will be great when bottled and allowed to carb up. Hoping to have it finish around 1.010-1.015 est. about 7-8%A.B.V. One change I did with this batch was to not use the bark of the ginger when brewing the wort and did not let it ferment for more than the first two weeks with the fruit and spice and ginger in the wort. Used to get a funny smell from the beer when done. It drank well just had a funny smell. Sample tonight crisp clean and refreshing just a little sweet no odd smell. Sounds wonderful Rambunctious. I must try your recipe after we complete our house move later this month. Elderflowers are quite recognisable just search for a pic online you'll soon be able to tell if the one by the lake is an elder tree or not. Id recommend picking the flowers and making the wine the same day, its not essential but you get a better flavour and its less likely that you'll have to add yeast. I've added yeast to mine as the flowers were given to me by a mate, and I didn't have time to make it straight away. I froze them, probably killing any natural yeast on the flowers themselves. There are probably enough yeasts floating around my house as there a few things fermenting in unsealed containers knocking about, but I was a bit pressed for time with the first batch and couldn't risk fermentation not starting straight away. As for not taking too many, you only need about 10-15 heads per gallon batch so unless other people are using the same tree it shouldn't be an issue. Ok back to the ginger beer. Batch number 3 seems to be carbonating a lot more than the first 2. It might be due to the hot weather were having, or possibly the yeasts have had more of a chance to multiply from being in the culture jars for so long. The "final recipe from the start" experiment is bubbling away nicely. It has occurred to me that I might have to add a bit of priming sugar when I bottle, Ill test the gravity and keep you posted. Thanks Ray, very helpful. I do love being out in the countryside, and I am pretty sure we have what I think is a large Elderflower tree up by our fishing lake so I might be able to get some from there (we don't have any homebrew outlets here in Guernsey, hence why I couldn't get hold of a fermenting bin). 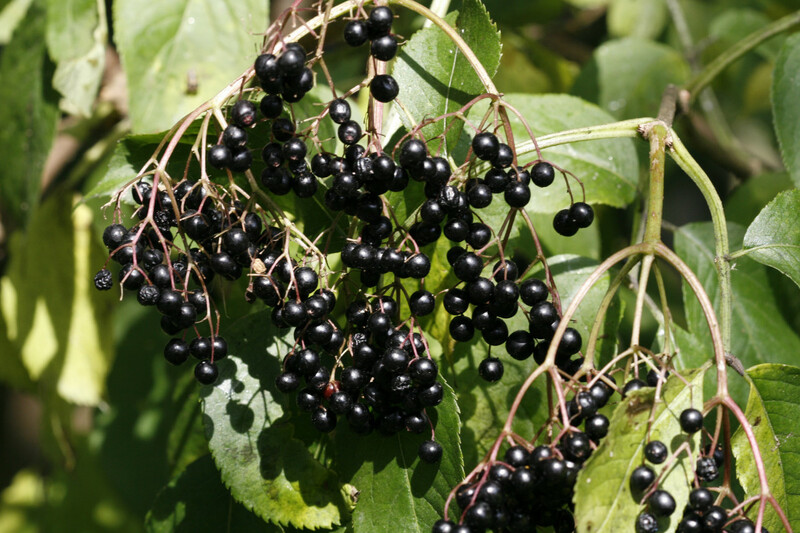 Love your comment about the birds and the berries, I was thinking that Elderberry wine is also very good, so that is another good reason to leave flowers on to develop into berries. I wouldn't be taking a vast amount anyway, just enough for a couple of demijohns of wine. You can buy dried Elderflower from a lot of Homebrew outlets. It,s not hugely expensive to buy, Cost / Time it might be better unless you enjoy the walks and picking your own. There is a weed that looks like Elderflower but it does not grow into trees. The Scent is also a giveaway. What a fabulous and informative update M2M. Can't wait to hear about your next results and comparisons. The comments here are really a fantastic resource for anyone who is thinking of trying these experiments in brewing for themselves. I really want to try to make the Elderflower wine for myself, but need to make sure I am correct in identifying the Elderflowers and don't get them mixed up with a similar looking weed (the results could be horrible lol). A quick update for you guys, batch number 3 was great, not as gingery as id like, just have to add more next time! The half made with demerara sugar had more of a rum like flavour, a bit too much to be honest so with the next batch I went with a 350g white 100g demerara mix. this batch should be interesting too as its been in the starter jars for over 2 weeks and ive kinda been neglecting it, but yesterday added some sugar and it seemed to come back to life nicely. I bottled up today, and with some of the spare bug I am experimenting with making up the final recipe right from the start, adding the bug to 5L water, 450g sugar, 8 tblsp of dry ginger and 2 tsp lemon juice into a demi-jon covered with a cloth. Im going to leave it for a week and, when I bottle the next batch from the culture jars, Ill strain it out and bottle into plastic bottles with the rest of it to see if there is any noticeable difference. If not itll certainly make life easier not having to remember to feed it every day. Ill let you know what happens. Im not sure if I mentioned in my other post what I mean by a ginger beer bug, its the term used to describe the "fake" ginger beer plant that is described in the recipe above, using yeast other than 'saccharomyces florentinus' to simulate the effects of the ginger beer plant. By the way the sparkling elderflower wine was great and so simple to do too, again its one you can do by adding yeast or leaving the natural yeasts to do their thing. I made another batch today while bottling up the ginger beer! Thanks for the tip Ray (long time no see, so good to have you visit again). I always heard Elderflower Wine was lovely, but confess I only tried it once many years ago when my Uncle made a batch using one of those kits you used to buy from Boots (the syrup rather than the actual flowers). I would love to try making it myself though using the real flowers. The Sparkling Elderflower Wine is like Champagne to drink, i prefer the Elderflower. Well worth the Effort. You can now buy Elderflower Schoer if you are lucky enough to have a shop near that stocks it. Not as good as Elderflower wine but it does taste like Elderflower and is good with dinner if you have visitors that need to drive home. Wow, thanks for such a detailed reply M2M, sounds like you are really getting in to this, and I truly wish you every success. It would be wonderful if you can post back here with the results of your efforts, especially any differences you have between the shop bought ginger and the ginger you grow yourself. Can't wait to hear more. Hey ive recently started brewing beer and im goin to be making some sparkling elderflower wine soon. Ive had a ginger beer bug on the go for a few weeks now, just finishin drinkin the last of the second batch. Third batch is in the bottles. I started the bug using ground ginger, white granulated cane sugar, de-chlorinated water and beer yeast. Left it for 7 days (feeding daily with sugar and ginger) in a jar covered with a cloth, strained and added to make up 5L with more sugar and citric acid. The first batch was a disaster, I think when I strained it, the cloth I used was too fine so there wasnt enough yeast left in the bottles. It didnt carbonate at all and was very sweet, almost undrinkable untill I added some rum. Second batch was much better, I had split the bug in two and had both in seperate culture jars, one being fed with demerara sugar and the other white. When I came to bottle I didnt have enough white sugar so bottled both using demerara sugar and lemon juice, no noticeable difference between them. I also had the issue of floating lemon bits but just strained them out when pouring into glasses. Much better carbonation, colour, and taste. After 10 days the taste had improved dramatically from the first tasting at 7 days. Third batch was bottled on sunday one culture with white sugar and one with dememara, should be more of a difference with these ones! I have also read through all the comments and have even taken the time to read Ward's study report, took a while but I got through it in the end from what Ive understood it that a ginger beer plant is a symbiotic organism consisting of the yeast 'saccharomyces florentinus' (refered to by Ward as its former name 'saccharomyces pyriformis') and the bacterium 'B. vermiforme'. He suggests that even combined with other types of bacterium or yeast respectively they wouldnt form the same bond, and that they were probably introduced from the ginger bought from the grocers it would be nice to know if he ever continued the research in that direction. I would imagine shop bought ginger these days are unlikely to be carrying one or both of the required elements. I believe that they originally combined in a few different locations and as they probably yielded the better flavoured ginger beer were the ones that got passed around most. The ginger beer plant as such is quite rare and hard to make from scratch unless you happen to have the correct combination of bacteria and yeast in your ginger or floating in your kitchen. Dont think im saying not to try though, you might get lucky! Im certainly going to give it a go, probably with shop bought ginger first while I grow some of my own, just to give it a go. If it doesnt work then ill buy some from somewhere. Hi again, I had started another batch 3 weeks ago and was a little disappointed in the low alcohol content as only 4% so I added more sugars. Starting gravity was 1.000 let it go for three weeks reusing previous ginger beer plant and today it tested at 1.020. If I am calculating correctly this stuff is somewhere around 9-10%.... I drank the sample for taste and it is very good. Further tastings will confirm or debunk A.B.V. Content. 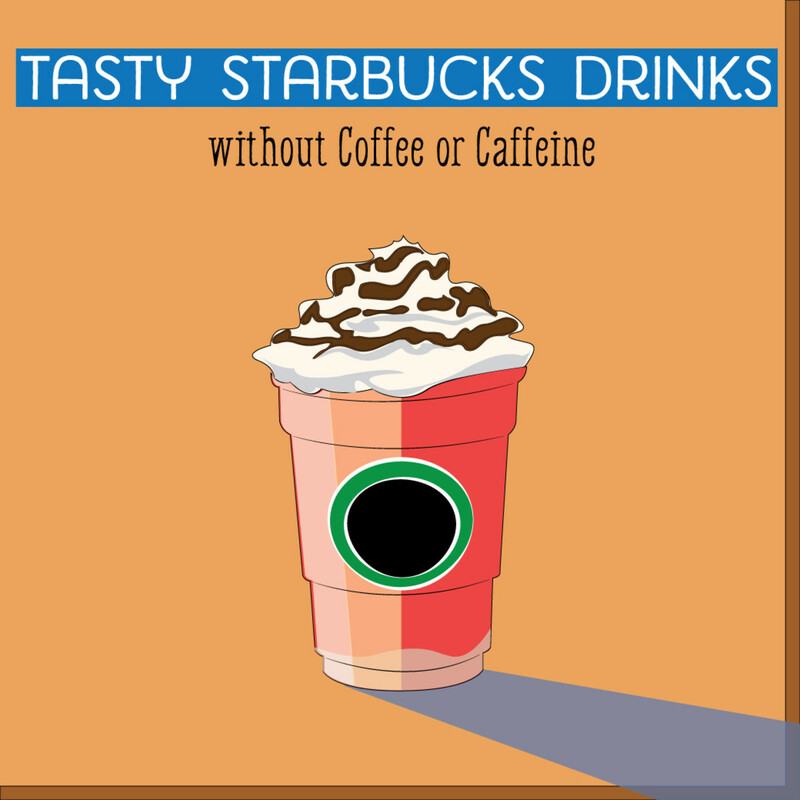 That sounds so delicious Rambunctious, I could drink one over ice right now (even though it is freezing cold over here). Well I am finally racking off my ginger beer. The final gravity is 1.02' starting was 1.052 calculated A.B.V. Should be around 4% . I am adding another 2 cups priming sugar to this batch and will let settle for a couple of days before bottling. The hard part waiting for another 3 weeks for it to get fizzy. I also am going to start another batch. I plan to increase the sugar a little and recycle the G.B.P. I should have plenty when the warm weather finally gets to Wisconsin. I am sure your patience will produce the results you want Ray. Good things come to those who wait :) I would be ultimately interested to hear what the comparison was like if you did make a batch from authentic GBP and compare the results though. The Wine is still brewing , slow but sure. Still using the original Ginger Mash. I have not removed the ginger. It,s very slow to ferment but i am going to let it carry on and see how it turns out. Still not tempted to buy GBP. I will get some sometime just to compare the outcome from both. Sounds very promising Rambunctious, especially after just 2 weeks. Can't wait to hear the final alcohol percentage of the finished batch. Well, I took a sample after 2 weeks fermenting and hydrometer shows S.G. of 1.32 calculated an A.B.V. Of around 2.9%. I will let it go for another 2 weeks and retest. I will also add some priming sugar and bottle. Thanks Rambunctious, I really appreciate that supportive comment. Personally I came to the conclusion in the end that 'Knowitall' was trolling this page, and as he was becoming quite offensive and aggressive in his comments I took the decision not to allow any more of them. He did try to post here a week or two back, but I deleted his comment as opposed to approving it so no-one got to see it. I was rereading previous posts and you know ... People who knowitall really bother those of us that do. So far every time I have tried to produce a ginger beer plant as you had described and I had modified the method. It has always worked... Just need to use raw organic ginger and do not wash or sterilize the first small starter batch. Well brewed up another 5 gal. batch as decribed in previous posts but added a cup of honey for fun. Starting gravity measured 1.5 so if this ferments out should be around 5.9-6.5 A.B.V. when done. I like the blackstrap molasses idea. Might have to give it a whirl next time. I honestly don't know Anita, I have never tried them as we don't have access to molasses in Guernsey (UK) shops. As they are sugar I would have thought they could work, but the best thing you can do is have a go and see if it is successful. Assuming you do I would love it if you could post back here and let us know how you got on. Can blackstrap molasses be used instead of sugar? Sounds great Rambunctious, fascinating method of getting started too. Would love to hear how this works out. Well I am at it again. I have simplified the ginger beer plant starter recipe. 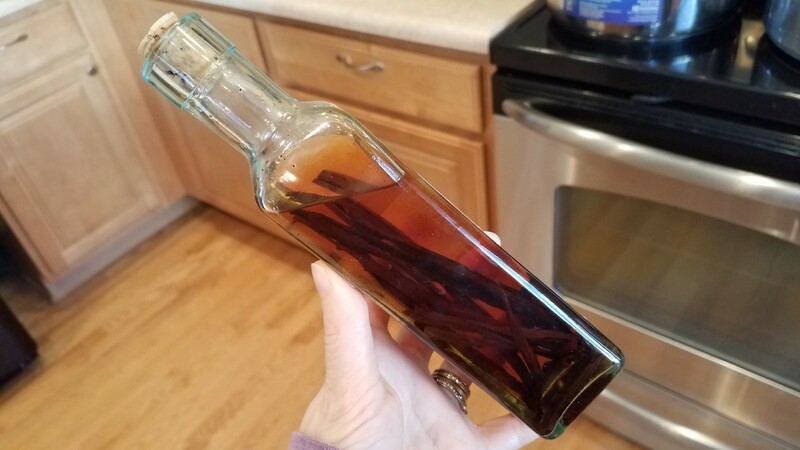 I simply use a blender and blend raw organic ginger root skin and all in about 4 cups of a simple sugar solution pour it into a bottle and shelve for two weeks under and air lock. The first week I open and tip the bottle to let any co2 pour out cap and shake vigorously then shelve for the next 24 hrs. Repeat for 7 days. Then check for signs of fermentation for another week. Success with be starting another 5 gal batch of ginger beer soon. Great to 'see' you Ray, hope all is well with you and your latest batch ;) Let me know how it turns out. Still have one on the go. Just looking in. That's a great hub - memories of making my own ginger beer for my own children - really interesting, thank you for sharing. If you can get fresh ginger you are in the perfect position to make your own Ginger Beer lemonkerdz. The only difference of course is that using this method yours will be alcoholic as opposed to a soft drink. Good luck and let us know how you get on.